In the series we can follow the fantastic adventures of Mézga Aladár and his dog, Blöki. In the series we can see the every days of Frakk, the fear of cats. In the turmoilous 18th century, young poor Hungarian aristocrat Jonas helps Szaffi, a young pretty gypsy Romani girl and the illegitimate daughter of a Turkish pasha, get the treasure that's owed to her by the right of inheritance. 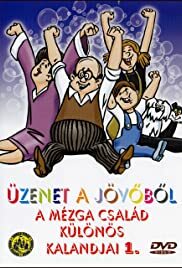 This funny crime/comedy was the beginning of the Csöpi&Kardos-films (starring István Bujtor and András Kern). A traditional Hungarian poetic fairytale that describes the epic adventures of a young shepherd through love, war, magic and death. I used to watch it on Italian TV in the 80s, and I remember it as a very good cartoon, full of humour and inventions. At that time, TV used to show mostly Japanese anime, so "La Famiglia Mezil" offered quite a refreshing diversion. I would have never imagined it was written in Hungary, since the western propaganda usually painted the eastern block as dull and repressed populations. Well, this cartoon could have been made in Italy, and it would have been just the same. The animation looks very good too, especially if compared to other eastern European productions of the same period. Well done, Pannonia Studios!